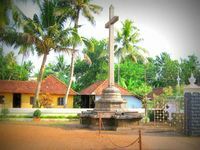 In the very beginning of Christianity in Kerala St.Thomas One of the twelve apostles of Jesus Christ Landed at malankara near kodugallore at Kerala Around A.D.52.He established seven and half churches. Those are, Kodugallore, Palyoor, Kottacave, Kokamangalam, Niranam, Chayal, Kollam and the half church at Thiruvithamkode…………..
ON his way from Kollam in northeast Direction he arrived at Niranam “Thrikpapaleswaram” by sea .He converted four Hindu families to Christianity “Manki, Madithilan, Thyil, and Pattamukkil, are the first four families converting to Christianity. He also gives priestly powers to the members of these families. The name Pattamukkil is derived from “Bhattathiri Mukhyan”and “Pattamukkil” Became a family name at Niranam .The only survivors of the four families converted by St.Thomas at Niranam today.Patamukkil Tharavad at Niranam surrounded from three sides by Niranam church. Priests from Pattamukkil families used to stay there and done priesthood and governed Niranam church and its properties at the ancient days.